Climbing Kilimanjaro is probably one of the most dangerous things you will ever do. Every year, approximately 1,000 people are evacuated from the mountain, and approximately 10 deaths are reported. The actual number of deaths is believed to be two to three times higher. The main cause of death is altitude sickness. Everyone climbing Mount Kilimanjaro should be familiar with the symptoms of altitude sickness. And everyone climbing Kilimanjaro should choose an operator like Ultimate Kilimanjaro® that has the proper safety systems in place. Our guides conduct twice daily health checks using a pulse oximeter to monitor your oxygen saturation and pulse rate. Our staff has the ability to initiate helicopter evacuation through Kilimanjaro Search and Rescue (SAR), a helicopter rescue operation. The abovelisted measures ensure that Ultimate Kilimanjaro® guides and staff are prepared to keep our climbers safe and have the ability to treat climbers who become ill or injured. Your health and well being is our first priority. We present the above scenarios not to scare you, but to inform you. Because anyone who contemplates climbing Kilimanjaro must understand the risks. While the dangers associated with high altitude trekking can never be completely eliminated, they absolutely can be minimized by a competent, professional operator. And we are not exaggerating when we say that we here at Ultimate Kilimanjaro® would be comfortable sending our own friends, family and loved ones on Kilimanjaro with less than a dozen active companies. The percentage of oxygen in the atmosphere at sea level is about 21%. As altitude increases, the percentage remains the same but the number of oxygen molecules per breath is reduced. At 12,000 feet (3,600 m) there are roughly 40% fewer oxygen molecules per breath so the body must adjust to having less oxygen. Altitude sickness, known as AMS, is caused by the failure of the body to adapt quickly enough to the reduced oxygen at increased altitudes. Altitude sickness can occur in some people as low as 8,000 feet, but serious symptoms do not usually occur until over 12,000 feet. In the first category, high altitude, AMS and decreased performance is common. In the second category, very high altitude, AMS and decreased performance are expected. And in extreme altitude, humans can function only for short periods of time, with acclimatization. Mount Kilimanjaro's summit stands at 19,340 feet - in extreme altitude. At over 10,000 feet (3,000 m), more than 75% of climbers will experience at least some form of mild AMS. Normal activity is difficult, although the person may still be able to walk on their own. At this stage, only advanced medications or descent can reverse the problem. It is important to get the person to descend before the ataxia reaches the point where they cannot walk on their own (which would necessitate a stretcher evacuation). Descending only 1,000 feet (300 m) will result in some improvement, and 24 hours at the lower altitude will result in a significant improvement. Severe AMS requires immediate descent of around 2,000 feet (600 m) to a lower altitude. There are two serious conditions associated with severe altitude sickness; High Altitude Cerebral Edema (HACE) and High Altitude Pulmonary Edema (HAPE). Both of these happen less frequently, especially to those who are properly acclimatized. But, when they do occur, it is usually in people going too high too fast or going very high and staying there. In both cases the lack of oxygen results in leakage of fluid through the capillary walls into either the lungs or the brain. Confusion, and irrational behavior are signs that insufficient oxygen is reaching the brain. In cases of HAPE, immediate descent of around 2,000 feet (600 m) is a necessary life-saving measure. Anyone suffering from HAPE must be evacuated to a medical facility for proper follow-up treatment. (Also see Why Does Acute Mountain Sickness (AMS) Occur?). Our guides are all experienced in identifying altitude sickness and dealing with the problems it causes with climbers. They will constantly monitor your well-being on the climb by watching you and speaking with you. Twice daily, in the morning and evening, our guides will conduct health checks. A pulse oximeter measures oxygen saturation - tthe oxygen level in your blood - and your pulse rate. The oximeter is placed on a climber's fingertip. The oximeter uses two beams of light that shine into small blood vessels and capillaries in your finger. The sensor reflects the amount of oxygen in the blood. As altitude increases, oxygen saturations decrease. Proper acclimatization generally brings oxygen saturations higher, which is why these figures typically rise when oxygen saturations are tested after resting overnight. On Kilimanjaro, oxygen saturations percentages are regularly in the 80's. There are no definitive saturation levels where a client can be declared absolutely safe or at risk. However, when oxygen saturation drops below 80%, we monitor that climber very closely. Additionally, our guides will administer the Lake Louise Scoring System (LLSS) to help determine whether you have any symptoms of altitude sickness and the severity. LLSS is a set of questions designed to assess adults for symptoms of AMS. It is important that you be open, active and honest when answering these questions and with your guide overall. If you do not feel well, do not try to pretend you are fine. Do not mask your symptoms and say you feel OK. Only with accurate information can the guide best treat you. Of course, there is always the chance that you will have to abandon your climb. In these situations, the guide will tell you to descend. It is not a suggestion or request, but an order. The guide's decision is final. Do not try to convince him with words, threats or money to continue your climb. The guide wants you to succeed on your climb, but will not jeopardize your health. Respect the decision of the guide. Pre-acclimatize prior to your trip by using a high altitude training system. Ascend Slowly. Your guides will tell you, "Pole, pole" (slowly, slowly) throughout your climb. Because it takes time to acclimatize, your ascension should be slow. Taking rest days will help. Taking a day increases your chances of getting to the top by up to 30% and increases your chances of actually getting some enjoyment out of the experience by much more than that. Do not overexert yourself. Mild exercise may help altitude acclimatization, but strenuous activity may promote HAPE. Take slow deliberate deep breaths. Climb high, sleep low. Climb to a higher altitude during the day, then sleep at a lower altitude at night. Most routes comply with this principle and additional acclimatization hikes can be incorporated into your itinerary. Eat enough food and drink enough water while on your climb. It is recommended that you drink from four to five liters of fluid per day. Also, eat a high calorie diet while at altitude, even if your appetite is diminished. Use FDA approved drug Diamox for prevention and treatment of AMS. Avoid tobacco, alcohol and other depressant drugs including, barbiturates, tranquillizers, sleeping pills and opiates. These further decrease the respiratory drive during sleep resulting in a worsening of altitude sickness. If you begin to show symptoms of moderate altitude sickness, don't go higher until symptoms decrease. If symptoms increase, descend. (Also see Are You Afraid of High Altitude? How to Approach Mount Kilimanjaro's Biggest Obstacle and Who's Responsible for Your Safety on Mount Kilimanjaro? You Are). Diamox (generic name acetazolamide) is an F.D.A. approved drug for the prevention and treatment of AMS. The medication acidifies the blood, which causes an increase in respiration, thus accelerating acclimatization. 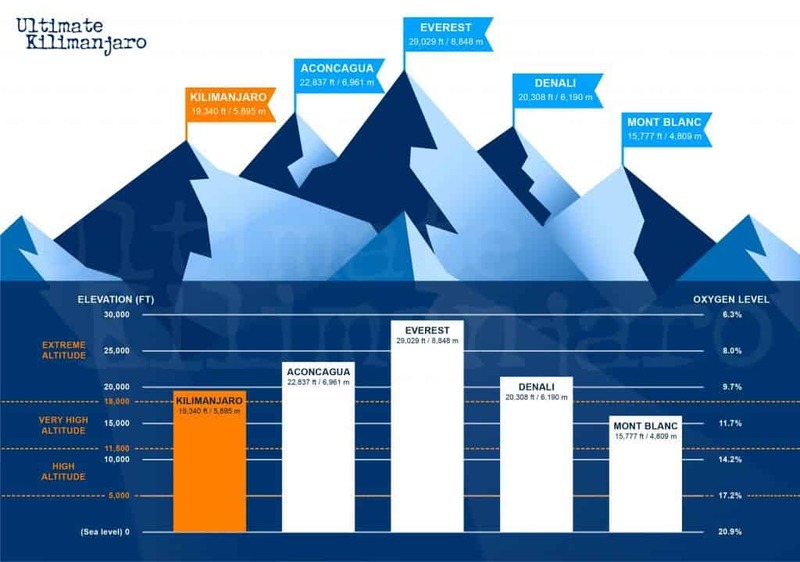 Diamox does not disguise symptoms of altitude sickness, it prevents it. Studies have shown that Diamox at a dose of 250 mg every eight to twelve hours before and during rapid ascent to altitude results in fewer and/or less severe symptoms of acute mountain sickness (AMS). The medicine should be continued until you are below the altitude where symptoms became bothersome. Side effects of acetazolamide include tingling or numbness in the fingers, toes and face, taste alterations, excessive urination; and rarely, blurring of vision. These go away when the medicine is stopped. It is a personal choice of the climber whether or not to take Diamox as a preventative measure against AMS. Ultimate Kilimanjaro® neither advocates nor discourages the use of Diamox (see Diamox: Does it Mask AMS?). Ibuprofen can be used to relieve altitude induced headaches. We carry bottled oxygen on all of our climbs as a precaution and additional safety measure. The oxygen cannister is for use only in emergency situations. It is NOT used to assist clients who have not adequately acclimatized on their own to climb higher. The most immediate treatment for moderate and serious altitude sickness is descent. With Kilimanjaro's routes, it is always possible to descend, and descend quickly. Therefore, oxygen is used strictly to treat a stricken climber, when necessary, in conjunction with descent, to treat those with moderate and severe altitude sickness. We are aware that some operators market the use of supplementary personal oxygen systems as a means to eliminate the symptoms of AMS. To administer oxygen in this manner and for this purpose is dangerous because it is a temporary treatment of altitude sickness. Upon the cessation of the use of oxygen, the client will be at an even higher altitude without proper acclimatization. 99% of the companies on Kilimanjaro do NOT offer supplementary oxygen - because it is potentially dangerous, wholly unnecessary and against the spirit of climbing Kilimanjaro. The challenge of the mountain lies within the fact that the summit is at a high elevation, where climbers must adapt to lower oxygen levels at altitude. Using supplementary oxygen is akin to putting the mountain at sea level, where nearly everyone can summit (see Should I use Supplemental Oxygen on Kilimanjaro?). Large, one-wheeled rescue stretchers are found on Mount Kilimanjaro but they are only available within a small area of the park. That means that if a climber is unable to walk due to severe altitude sickness or a leg injury that compromises mobility, getting that climber down the mountain could pose difficult challenges for Kilimanjaro operators. Usually it means assisting the injured climber by carrying him or her on one's back. At Ultimate Kilimanjaro®, we carry a portable stretcher at all times in case of emergencies when a climber is unable to walk on their own and the trekking party is some distance away from the park's stretchers. Our portable stretchers are compact, strong and lightweight. The device can be used to evacuate an injured climber quickly off the mountain. To use, the subject is secured to the stretcher using straps. Then porters hold on to the hand grips to usher the climber to safety. The Gamow Bag is portable hyperbaric chamber used to treat AMS. The inflatable bag simulates descent to lower altitude. The patient is placed inside the bag and it is inflated with air to increase the concentration of oxygen. A Gamow bag weighs about 12 lbs. Inflated, the bag is about 7 feet long and 2 feet in diameter. At 9,800 feet (3,000 m), the Gamow Bag can simulate a descent of 4,800 feet (1,500 m). After two hours in the bag, the person's body chemistry will have "reset" to the lower altitude. This acclimatization lasts for up to 12 hours outside of the bag which should be enough time to get them down to a lower altitude and allow for further acclimatization. Our staff does not carry Gamow bags. Use of a Gamow bag on Mount Kilimanjaro is impractical because descent is the most immediate, accessible treatment. We are partnered with Kilimanjaro Search and Rescue (SAR), a helicopter rescue operation which conducts modern, efficient rescue services on Kilimanjaro. Airbus AS 350 B3 helicopters waits nearby at Moshi Airport. Once a distress call is received, rescue procedures are activated within five minutes. Expert pilots, highly trained rescue doctors and emergency flight technicians are exceptionally qualified and prepared for all emergencies on the mountain. Kilimanjaro SAR manages a medical clinic that focuses on high altitude related illnesses, mountain medicine, and trauma. It is staffed 24 hours a day by physicians, nurses and assistants offering the best possible treatment. This group is advised by a unique Clinical Advisory Team made up of top level medical and high altitude professionals. Note that this service is only available to clients who have the required travel insurance. Special travel insurance is mandatory to participate in our trips. Clients must be covered to trek at high altitude up to 6,000 meters to qualify for Kilimanjaro SAR rescue. Your travel insurance will be verified by our staff before the trek.